Napoli chief Aurelio De Laurentiis claims Chelsea manager Maurizio Sarri is only after money following his switch to Stamford Bridge in the summer. According to a UK Mirror report citing Corriere dello Sport, De Laurentiis previously, slammed the 59-year-old for not winning any silverware during his stay at Naples. 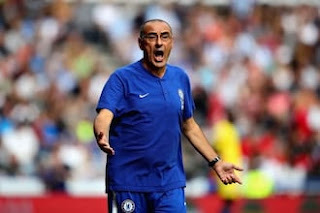 Sarri sealed a move away from the Serie A outfit to Chelsea on a three-year deal, after series of meetings between the two clubs bothering mainly on compensation package. Interestingly, Sarri was still at under contract at Napoli when the club chief, Laurentiis unveiled Carlo Ancelotti as the club’s new manager. Since his arrival at west London, Sarri has brought a new lease of life to the Blues squad, who now play a new brand of football. At the moment, Chelsea have 20 points from a maximum 24 points in their first eight matches of the season. However, Sarri’s performance with Chelsea so far, appears not going down well with the outspoken Napoli chief De Laurentiis. "Sarri? I thought I had met a coach who would stay at Napoli for a long time. At a certain point it became a question linked exclusively to money," De Laurentiis was quoted as saying by Corriere dello Sport. "Suddenly, it was established by the media that his contract must be adjusted. So what is the value of an agreement just signed? We had already gone from €700,000 to €1.5million. "I also once heard him say that for his next contract, he wanted to get rich. "Sarri's declarations of love for the city? I believed it, but then I wondered: 'What if he was using me as a bank?'" The Italian tactician and his Chelsea squad are expected to return to Premier League action against Manchester United after this month’s international break. The former Napoli coach replaces Antonio Conte, who was officially sacked on Friday, July, 13, by the Blues. Sarri signs a three-year contract, having left his former employers after a long drawn out saga surrounding his contract.